On September 11th when the Vancouver Canucks Young Stars take the ice against prospect rosters from Calgary and Winnipeg, fans in Penticton, British Columbia will be treated to an exposé of the future in Vancouver. The roster includes eight defenseman, fourteen forwards and two goaltenders. Some of those players have been acquired via the National Hockey League Entry Draft and others have been given an opportunity through free agency. Aside from the obvious names that will excite Canucks fans like Cole Cassels, Jordan Subban and Jake Virtanen skating in blue and green sweaters, there are a handful of other names that are cause for intrigue among the Canucks nation. When the Canucks sent Eddie Lack packing and fans in Vancouver were devastated by the loss of a favorite name, General Manager Jim Benning used his return – a 2015 3rd round pick – to pick up Guillaume Brisebois out the Quebec Major Junior Hockey League. At 6-foot-2 and 179 lbs Brisebois is still a frame waiting to be filled out but according to Benning “[the Canucks] got a player at top of the third round in Brisebois that we really liked”. Benning went on to explain that Brisebois was gauged as having top-four potential. Brisebois’ stats aren’t shockingly impressive but at seventeen years old Brisebois has a huge chunk of time to develop. In 2014-15, he notched 28 points in 64 games in the QMJHL. A respectable number for a second year player. The Young Stars tournament will be the first true test of Brisebois against players much older and more experienced than he. Remember a little guy named Chris Tanev, signed as an undrafted free agent defenseman out of Rochester Institute of Technology? Nobody knew who the kid was, in fact he was never supposed to play an NHL game. Well that Chris Tanev just signed a 5-year, $22.5 million dollar extension with the Vancouver Canucks. The undrafted Ashton Sautner, who is documented at 6-foot-1 and 193 lbs, possesses some of the same impressive yet subtle qualities that Tanev did as a youngster. In Sautner’s 20-year old season in the Western Hockey League he recorded 51 points in 72 games from the blueline while wearing the “C” for the Edmonton Oil Kings. Sautner was never drafted to the NHL but did earn himself a three-year entry level deal with the Canucks in March of 2015 after a stellar over-age season. Sautner is seasoned after four years with a playoff-contending Edmonton Oil Kings organization and that plays to his advantage in the Young Stars tournament. There can be no expectations to see Sautner in a Canucks uniform in 2015-16 but it would be more than reasonable for him to earn a spot in Utica. A year or two in the minors and this kid might just become the next Christopher Tanev. Anytime a team can grab a young Eastern European player that has had experience in the Kontinental Hockey League, there is a legitimate possibility that he holds NHL capabilities. In Rodrigo Abols the Canucks are seeking Latvian name, one similar to the undrafted energy forward Ronalds Kenins, who signed a one-year, one-way deal for the upcoming season. Abols (6-foot-3, 179 lbs), who was undrafted before his invitation to the Canucks Young Stars tournament, only suited up for 14 games with Dinamo Riga (KHL) in 2015-16 but he found himself with 38 points in just 35 games playing for their farm team HK Riga. He signed a contract with the Portland Winterhawks of the Western Hockey League for the 2015-16 season as he is too young to play in the AHL or ECHL at 19 years old. 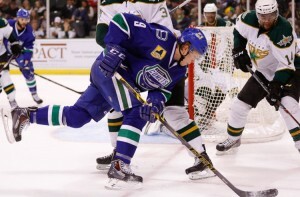 Nobody should be purchasing an Abols kit for their Canucks jersey just yet but if he can use 2015-16 as a transition year he could realistically don Utica Comets colors in 2016-17 and work his way into a bottom six role with the Canucks in the future, so long as he can continue to add muscle to his 6-foot-3 frame. Shinkaruk had a strong first season in the AHL, but inconsistencies have held him back from the NHL. 179 lbs. At that height he should be able to carry more muscle, but injuries and inconsistencies have hindered Shinkaruk’s progress as a professional. He had a strong year in Utica netting 16 goals and 31 points in 74 games while helping his team to a Calder Cup Final appearance but Shinkaruk has been subtly unseated by Jake Virtanen and Cole Cassels as the next big thing for the Canucks. Shinkaruk is one of only three players on the Young Stars roster that played the entire season in the American league last year. He still carries criticism for struggling against bigger, stronger players, so if he can dominate the players at this tournament he might silence some of those critiques. This may be a make it or break it year for Shinkaruk so look for some tenacity in his game. Kelowna Rockets Goaltender Jackson Whistle makes his second consecutive appearance at the Canucks Young Stars tournament, but this year he is coming off a 50 game, 34 win season where he carried his team to the Memorial Cup Final. After falling to fellow Canucks prospect, forward Cassels, Whistle will look to engrave his name in the Canucks goaltending hierarchy behind Jacob Markstrom, Thatcher Demko and Joe Cannata. After three seasons as a Western League backup, Whistle proved that he has starting capabilities, and he did so in a winning fashion. In the 50 regular season games he played he recorded a 2.55 GAA and .909 SV%. With Demko continuing his NCAA play there are openings for the twenty year old Jackson Whistle to move into the professional ranks. The Canucks will surely keep an eye on his ability to backstop NHL caliber prospect talent and see how far his winning season in the Western League helped his development.